A representative from Standing Together to End Sexual Assault will be leading a conversation regarding the prevention of sexual assault along with a self-defense workshop brought to you by the Office of the Student Advocate. 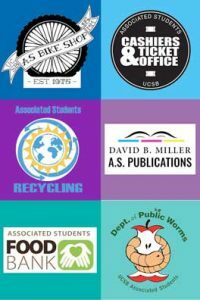 Come learn about what we do as the Zero Waste Committee and about our future events, like our “Waste-less Workshop”! Zero Waste Committee is having their first General Meeting on Thursday November 15th from 7-8 PM in the SRB! We will be meeting in the Chicano/Latino Cultural Resource Center (Room 1108). Come learn about what we do as the Zero Waste Committee and about our future events, like our “Waste-less Workshop”! We would love for you to bring any and all questions or ideas to our meeting! 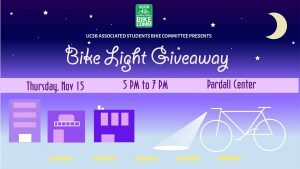 Get lit with us during our HUGE bike light giveaway next Thursday, November 15 from 5pm-7pm! In partnership with CHP and UCPD, we are giving out FREE bike like sets at the Pardall Center! 1 MORE HOUR UNTIL TICKETS FOR IN CONVERSATION WITH PRINCESS NOKIA GO ON SALE! TICKET LINK WILL BE POSTED AT 10AM! 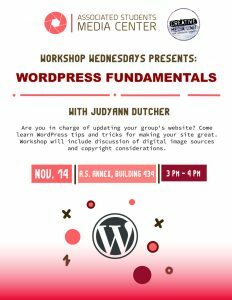 Workshop Wednesdays Presents “WordPress Fundamentals” with JudyAnn Dutcher for anyone tasked with creating or maintaining a website. 3-4pm in the AS Annex, Bldg. 434 next to the Storke Tower bike circle. Staff, Students, and Faculty welcome. 🌼 SABA – TOMORROW – IN THE HUB 🌼 Are you going? If you are passionate about volunteering and adventure, apply for the CAB Alternative Break Winter trip! Applications are out now, and will close TONIGHT at 11:59pm! !